Is International Community’s confidence in Colombo eroding..? (www.poreg.org)The United Nations and the Sri Lanka government are locked in a public spat for over a fortnight. Now it has taken a curious turn with a minister, Wimal Weerawansa, on protest fast unto death and the Secretary General recalling his chief representative Neil Buhne from Colombo while asking Sri Lanka to ‘live up to its responsibilities’ as a sovereign host of UN agencies. 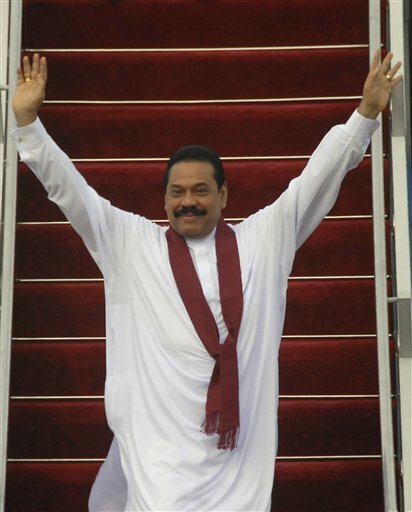 President Mahinda Rajapaksa has rejected the Weerawansa resignation. That did not prevent other cabinet ministers from visiting Weerawansa (40) to express solidarity with him. Opposition Parliamentarians are, however, very scathing in their denunciation of the fast as a stunt. The Secretary General is angry at the ‘blockade’ of the entrance to the UN office. It is ‘unacceptable that the Sri Lankan authorities have failed to prevent the disruption of the normal functioning of the United Nations offices in Colombo as a result of unruly protests organised and led by a cabinet minister of the government’, Ban’s spokesman said in New York. In the last week of June, Secretary General Ban Ki-moon appointed a three-member advisory panel on possible war crimes during the final phase of Sri Lanka’s war against Tamil rebels. The decision came as President Mahinda Rajapaksa was celebrating the first anniversary of the war victory, and the two electoral triumphs he had registered in the past six-months. The electoral victories not only rewarded him with a second term but also parliamentary majority, which, he is now planning to use for amending the constitution to remove the two term cap on presidency. The amendment is tailored made for him and not for his predecessor, Chandrika Kumaratunga. President Rajapaksa argues that there is no need for a UN panel because his army had committed no human rights violations. He considers the ‘Lessons Learnt and Reconciliation Commission’ appointed in May as an adequate mechanism. Outside the charmed Rajapaksa circle, this argument has few takers. Opposition Leader Ranil Wickremesinghe told Parliament Friday July 9 that the UN appointed the advisory panel was consequent on a joint-statement signed by Secretary General Ban Ki Moon and President Mahinda Rajapaksa. “In this statement, signed on May 23 last year, the government agreed to such a panel. The government has pledged to uphold human rights,” Wickremesinghe said. Expectedly, Foreign Minister Gamini Lakshman Peiris disagreed taking the stand that the joint statement was signed a few days after the conclusion of the war in May 2009 and that in the statement there was no mention of a need for a foreign mechanism to look into the human rights situation in Sri Lanka. He, however, admitted that Sri Lanka had agreed in the joint statement to take steps to improve the human rights situation. ‘We have, therefore, appointed the Lessons Learnt and Reconciliation Commission’. All this appears as officially orchestrated. The view is strengthened by an observation the Foreign Minister Gamini Lakshman Peiris made rather casually. He said in Colombo: “The government told Neil Buhne (UN Resident Coordinator in Sri Lanka) that the days of protests outside the main UN office (in Colombo) will end on Friday (July 9). Peiris observation came as the Secretary General ordered the shut down of Colombo office and summoned Neil Buhne to New York for consultations. The minister did not elaborate the basis of his remark. While President Rajapaksa’s SLFP is conspicuous by its unusually low profile, smaller parties in the ruling alliance like National Freedom Front (NFF) have taken to the centre stage. Its activists have blocked the entry to the UN compound and camped there staging protest action. The minister on fast, Weerawansa, is from NFF. Why only NFF came forward as the champion upholder of the prestige of the army? The Daily Mirror, a leading Colombo daily termed the minister’s action as ‘Theatrics of a death fast’. Its editorial cautioned: ‘By puppeteering the (NFF) allies for mischief, Sri Lanka has only gone to distance itself from the independent, moderate countries in the international community’. Other privately owned news papers also criticised the government for encouraging the protests and warned that it is pushing the country towards international isolation. Civilians normally get killed in a war situation. Civilian causalities were unavoidable since the Tamil rebels often used civilians as their shield particularly in the closing days of the war. But whether the Sri Lankan government was able to minimize the harm done to civilians remains a question. Till now there has been no categorical statement from the government. UN Secretary General Ban Ki-moon popped up this very question about civilian causalities in an interview to the Reuters from Kinshasa, the capital of Democratic Republic of Congo, which is celebrating 50-years of independence. ‘There is no reason why (the) Sri Lankan government (is) reacting negatively to my proposal’, he said. Sri Lanka, he said, should take all the measures ‘to make it accountable for all these perpetrators who have committed and violated international human rights and humanitarian laws’. Ban Ki-moon went on to say: ‘Now it is the right time for Sri Lanka President Mahinda Rajapaksa to demonstrate his commitment to the values of human rights’. Tamil diaspora, who are electorally an influential block in several western countries, and Human Rights groups and have been talking about human rights violations in Sri Lanka and death of at least 7000 ethnic Tamilians in the military’s final offensive. Some documentary evidence has surfaced in recent months but it was quickly debunked by the authorities in Colombo as fabricated. While Sri Lanka’s constitution upholds liberal values that befit a country which follows Buddhism as its main religion, emergency that has been in force for several years has placed direct and indirect restrictions on free speech and free press. The government has become an all –Rajapaksa enterprise with the President, his son and brothers controlling the main levers of power. And it has no plans to lift the emergency. It made this clear on the floor of Parliament while getting the mandatory monthly approval for emergency in June. To the great relief of Rajapaksas, their betenoire, General Sarath Fonseka, has come out publicly in support of the official stand that there were no war crimes in the Wanni War. ‘I have consistently maintained that the war was conducted according to internationally accepted norms. No war crimes were committed. Had war crimes been committed in Sri Lanka, it is I who will first be in trouble, not these empty mealy mouthed loud talking double tongued clowns,’ he told reporters at the Parliament House, when asked about government’s allegations that he (Fonseka) was planning to give evidence before the Ban Ki-moon’s UN panel. The former Army Commander, who is now an elected Opposition law maker went on to say that ‘some government-backed jokers’ were ‘misinterpreting and giving twists to the appointment of a commission by the UN Secretary General to advise him on the accountability during the last phase of the war against the LTTE. War crimes are at the root of Fonseka’s present troubles with President Rajapaksa. While on a private visit to the United States (to see his son and his family) after the war last year, Fonseka met American officials at the State Department and agreed to tender evidence on Rajapaksa government’s war crimes. Colombo summoned him posthaste and made him quit denying him even ceremonial farewell that is reserved for the retiring chiefs. Sedition charges have since been slapped and he is facing the prospect of a death penalty from a military court. Fonseka’s latest conciliatory gesture is not enough to see President Rajapaksa through the spat with the UN. It is part of a trade off that is in the works between the president’s aides and the general’s family in what is seen as a mutuality of interests. The opposition UNP also has come out openly against the UN investigation of war crimes. But it is not impressed by government’s response to Ban Ki-moon’s moves. ‘If charges are being leveled against the government, it is its duty to answer the charges. Refusing to answer them is to compromise the good image of the country’, says Lakshman Kiriella, senior UNP law maker and a former Minister. In his view, ‘all that the government is doing (in response to Ban’s UN Panel) is engaging in stupid and foolish talks and deeds’. The UN panel, headed by Marzuki Darusman, a former Indonesian attorney general, is given four months to give its report. None of its three members propose to visit Colombo with the Secretary General himself ruling out the need for such a visit. ‘The panel has a limited mandate. It’s advisory. 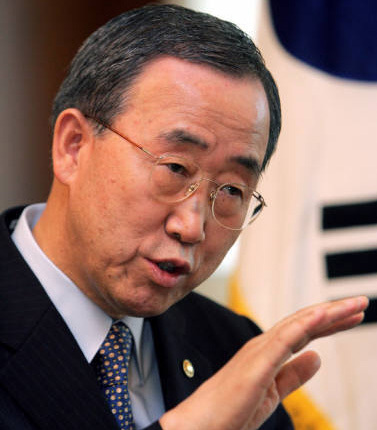 They have to advise me’, Ban Ki-moon said. But the Rajapaksa government is not convinced. It sees the UN Panel as a precursor to a full-blown war crimes investigation. 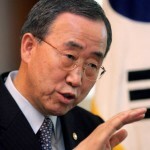 It pre-empted Ban Ki-moon’s action by setting up its own version of Truth Commission but the move has backfired with the opposition taunting the government about the Udalagama Commission that was appointed to investigate student murders in Trincomalee, murder of some French workers and others. ‘Where are the reports of those investigations? As the government is unable to provide answers to these questions the international community’s confidence in this government is eroded’, the opposition leaders have thundered. There have been several commissions, fact finding committees and advisory panels on a host of political, economic and social issues but all ended up the Udalagama Commission way. Even the all party committee President Rajapaksa had set up in his first term of office to break the Tamil impasse met the same fate, bringing into question the President’s democratic credentials and credibility even as he keeps reiterating his commitment to the 13th amendment plus. ‘The Plus is my contribution’ he told the Times of India without elaborating what the Plus stands for and the time frame for its implementation. The US, UK, several other western and even some non-aligned countries have seconded Ban Ki-moon’s decision. While next door neighbour, India’s stand has not been officially articulated as yet, Russia criticised him for not conferring with the Security Council or the General Assembly before announcing the UN investigating panel. China has, however, rallied publicly in support of President Rajapaksa. It fits in with Beijing’s track record of not bothering about domestic policies and troubles of rulers who brazenly further its economic and strategic interests.